On Monday, Sierra Nevada Corporation (SNC) announced some good news about the development of its Dream Chaser crewed spacecraft: NASA had certified the company had achieved the final milestone of its Commercial Crew Development phase 2 (CCDev-2) award with its October 26 glide flight at Edwards Air Force Base in California. 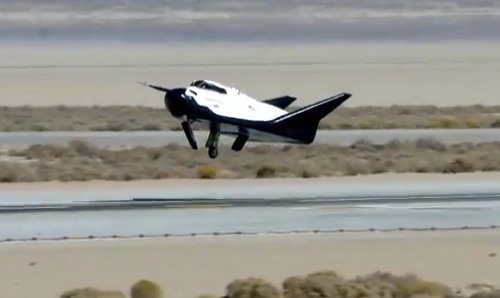 The vehicle’s “performance during flight exceeded predictions and requirements,” the company said in its press release, and NASA had awarded the company the full value of that milestone, $8 million, according to its amended Space Act Agreement with NASA for CCDev-2. The completion of the milestone closes out SNC’s CCDev-2 agreement and allows the company to focus on its Commercial Crew Integrated Capability (CCiCap) award it received from NASA in August 2012. SNC will also likely submit a proposal for the next round of the program, Commercial Crew Transportation Capability (CCtCap); proposals are due to NASA in late January with awards expected in summer 2014. The press release issued by SNC Monday makes no mention of the landing gear problem or the status of the Dream Chaser engineering test article. A separate statement by NASA only alludes to “an anomaly during landing and rollout” without going into more detail. The release also offered no new photos or video of the October 26 test or aftermath. As for additional footage of the flight? “At this time SNC is not going to release any additional photos or video regarding the free-flight test,” the spokesperson said. Jeff Foust | December 17, 2013, at 7:01 am | Category: Sierra Nevada Corp.